A while ago I made gluten-free southern fried chicken and it was really tasty and very popular with my family, to the extent that I wanted to try something new, but along the same lines. 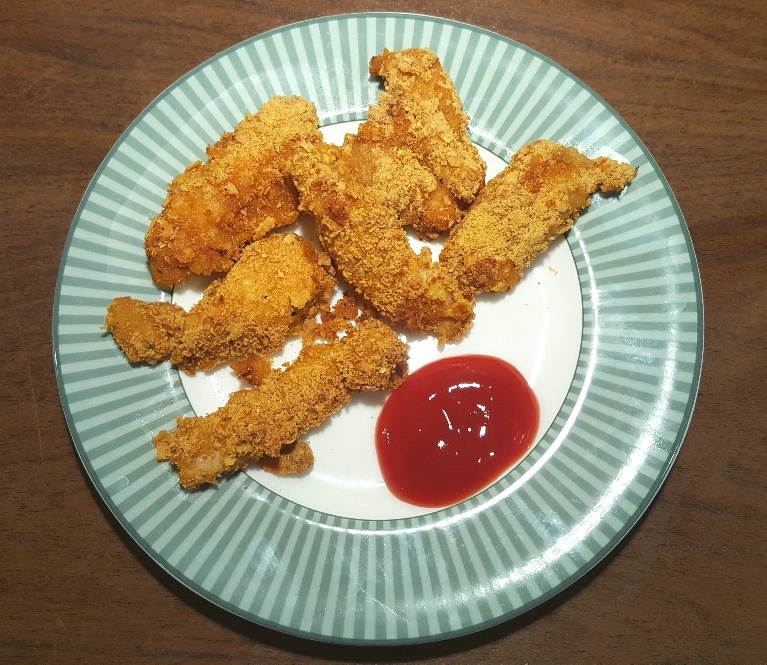 Another chicken recipe which seems to be very popular within gluten-free recipe circles is for chicken fillets which are coated with crushed cornflakes, a naturally gluten-free product. I was a bit sceptical as to how chicken pieces would taste wrapped in cornflakes, a product I would normally associate with breakfast, but thankfully it turned out to be really delicious. A lot of recipes for cornflake chicken tenders ask you to marinade the chicken pieces for a while before you coat them in the cornflakes, but I’ve tried making it both ways and I can’t really tell the difference so I’ve just went ahead and written up the recipe without doing it. However, feel free to experiment yourself. I’ve kept my seasonings quite tame, omitting the dried chilli and ground cumin that so many recipes call for because I wanted a gently seasoned piece of chicken that let the flavour of the chicken thighs shine through, but I did add dulse seaweed flakes to my mixture to add a depth of flavour that can rarely be found elsewhere. Dulse seaweed is seriously nutritious stuff, incorporating deep umami flavour while also being chock full of nutritional benefits such as iodine, potassium, magnesium, iron, protein and fibre. In fact, seaweed contains more minerals than any other vegetable. We’re really lucky in Scotland to have a brilliant company called Mara Seaweed which makes and sells seaweed to use as seasonings, so it’s theirs I tend to use in my cooking. I’d really recommend giving dulse seaweed a go because it’s a great seasoning alternative to using salt in your cooking, but you don’t need it to make this recipe for chicken tenders. 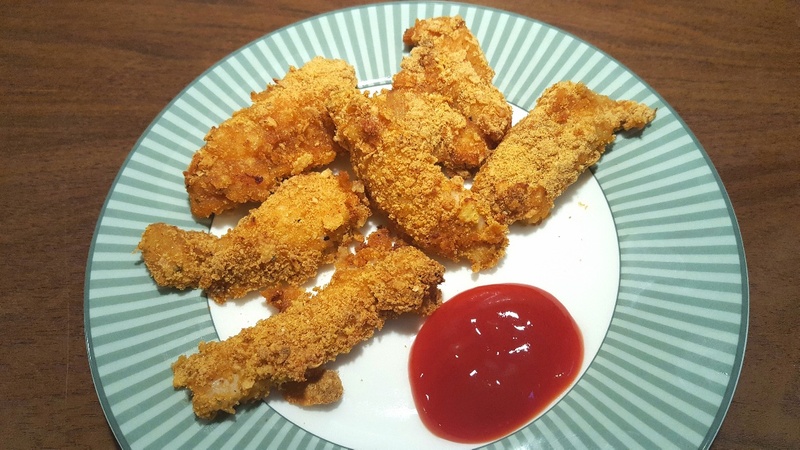 This recipe for cornflake chicken tenders creates soft, tender and juicy pieces of chicken thigh meat which are encased in a crispy, well-seasoned coating of crushed cornflakes. They’re delicious either on their own with a dollop of ketchup, served alongside a fresh salad, or placed in a floury bun and topped with good quality mayonnaise. However you serve them they’re finger-licking good! Preheat your oven to to 180°C/160C Fan/350F/Gas Mark 4 and prepare a non-stick baking tray . Place the chicken strips in a bowl and coat them in the rice milk. Crush the cornflakes, but don’t crush them so far that they become flour! In a separate bowl, add the crushed cornflakes, asafoetida powder and the seasonings and mix together before drizzling the oil over the top and tossing it through the mixture. Dip each of the chicken strips in the cornflake mixture, ensuring they are fully coated, before placing them on the baking tray . Bake in the oven for 15-20 mins until they are fully cooked through and serve.